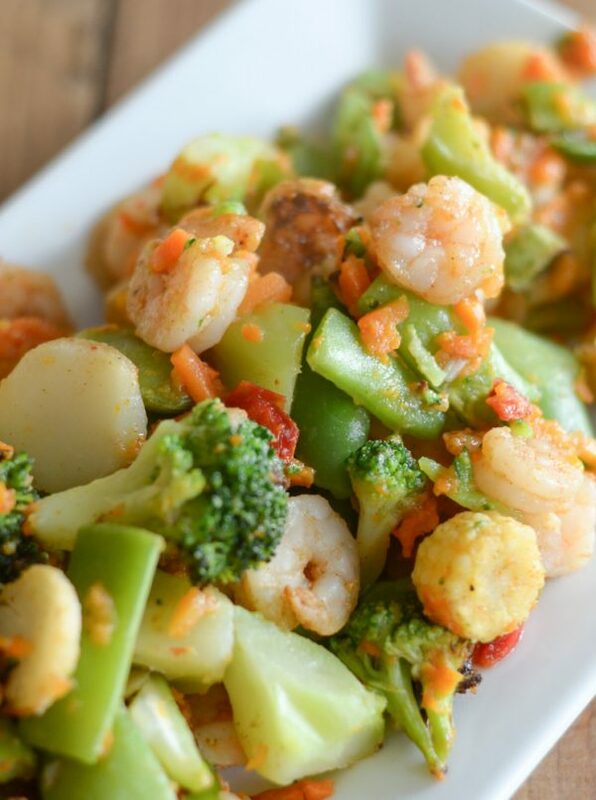 Another delicious Air Fryer Recipe is coming up with this Air Fryer Shrimp and Vegetables. 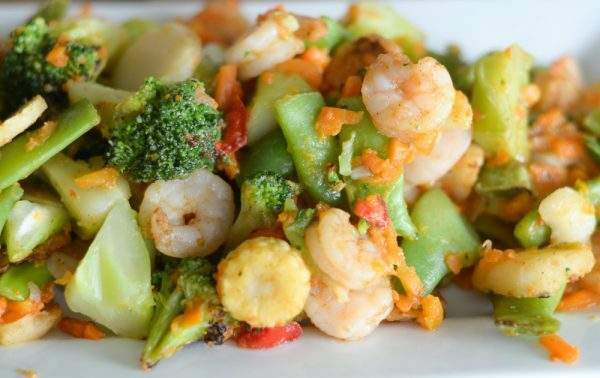 Not only is Air Fryer Shrimp and Vegetables great for dinner, it’s perfect for lunch. This tasty meal only takes about 20 minutes to make and it’s so simple, likely you have all you need right in your pantry and freezer. The only seasoning I used with a bit of olive oil spray and then Cajun seasoning, that’s all you need! 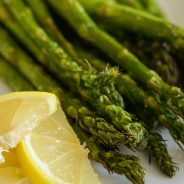 I continue to post Air Fryer recipes because for my family, it’s become a key to getting dinner on the table. Maybe I was getting tired of using the stove and oven? I’m not sure what it is really, but it’s SO FAST! It’s not only fast, but it’s very little clean up and it doesn’t heat up the whole house to cook something. That’s a win too, surely will be in the summer months. The Air Fryer has really altered the way I cook. 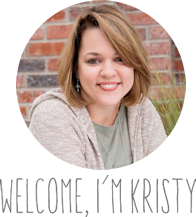 I can easily get dinner done in mere minutes while the kids are playing or doing homework, it just seems like everything taste better in the Air Fryer too. 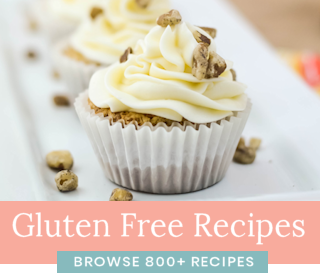 I have tried so many recipes and will continue to do so. I even saw that you can make Air Fryer Donuts. I can’t wait to try those! Don’t they sound wonderful? I have a few breakfast ideas in mind too that I plan to try soon in the Air Fryer. 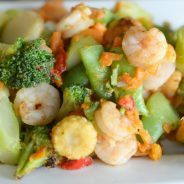 This Air Fryer Shrimp and Vegetables though is high on the list of simple recipes, it’s one of my husband’s favorites so far. 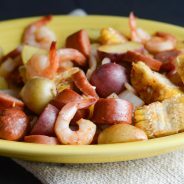 I have actually been purchasing the shrimp and vegetables every week and just adding it in as a go-to for a lunch or dinner if we are in a hurry. 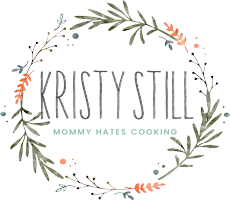 Air Fryer Shrimp is probably one of the easiest things to make in the air fryer. It really does not have to be in the air fryer long to cook either. 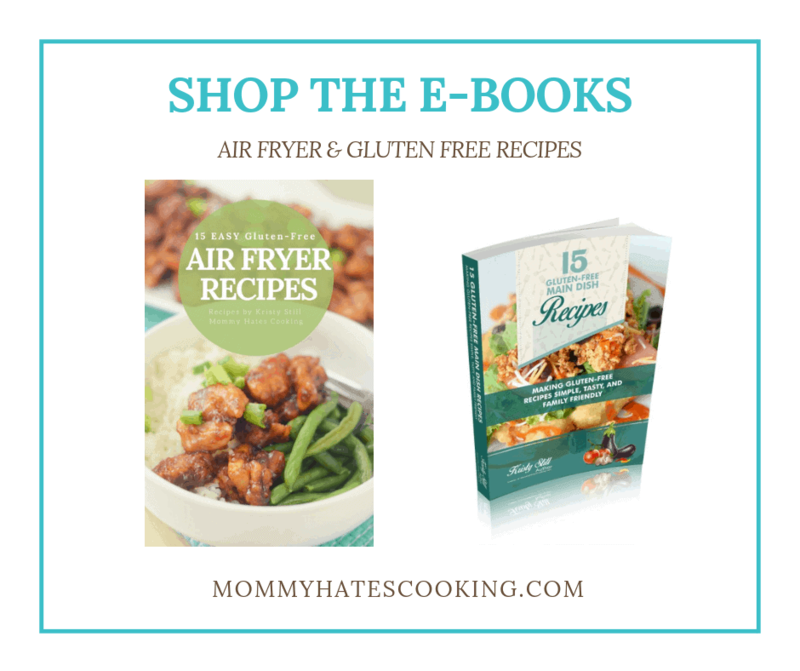 What do you need for Air Fryer Shrimp and Vegetables? 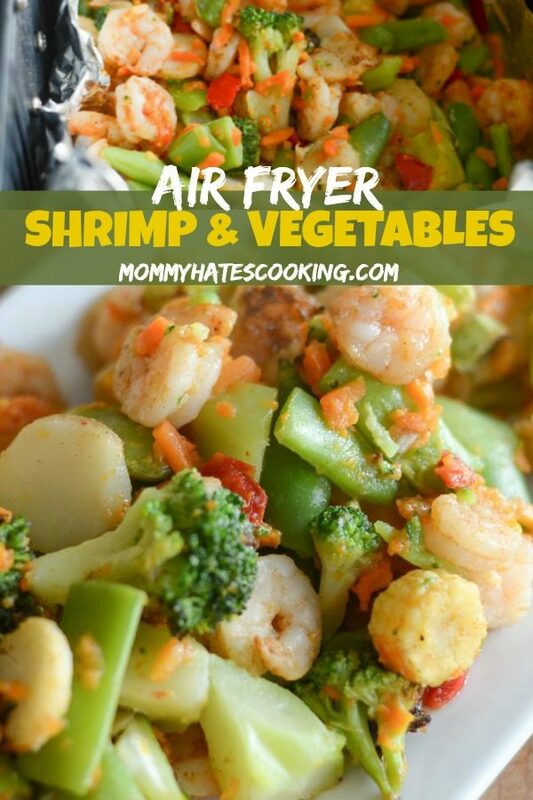 That’s all you need for this Air Fryer Shrimp and Vegetables, it’s super simple! 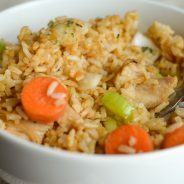 I typically cook my rice on the stove while it’s in the Air Fryer, but you could even just heat up the ready to serve rice too for an even faster option. I am anxious to try this again with my Honey Garlic sauce for the shrimp. That’s next on my list to try, I bet it will be delicious. I have never been much of a shrimp fan, but I have found that if I get the peeled and deveined shrimp, then cook it this way…I love it! Plus, it’s a great healthy option too. Now are you ready for this delicious meal? 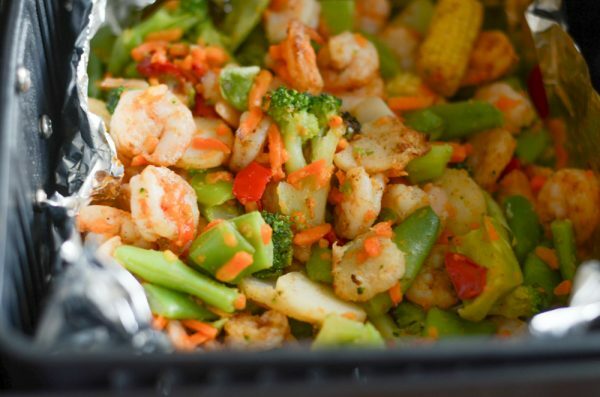 Enjoy this Air Fryer Shrimp and Vegetables! 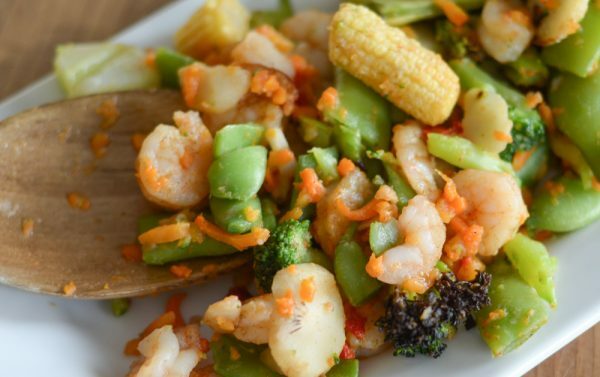 Make a delicious dinner with Air Fryer Shrimp and Vegetables. 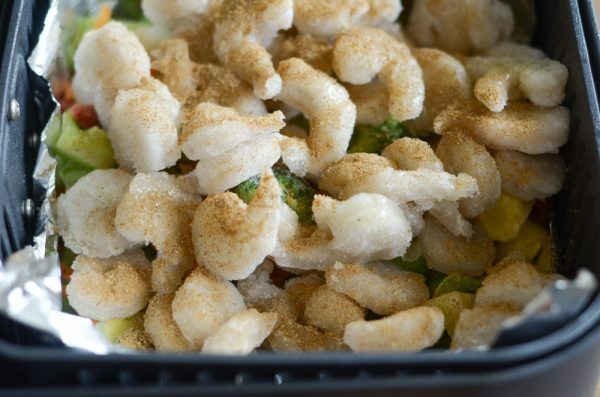 Add the shrimp and vegetables to your air fryer. Top it with the Cajun seasoning and spray with an even coat of spray. Cook on 355 degrees for 10 minutes. Carefully open and mix up the shrimp and vegetables. Continue cooking for an additional 10 minutes on 355 degrees.